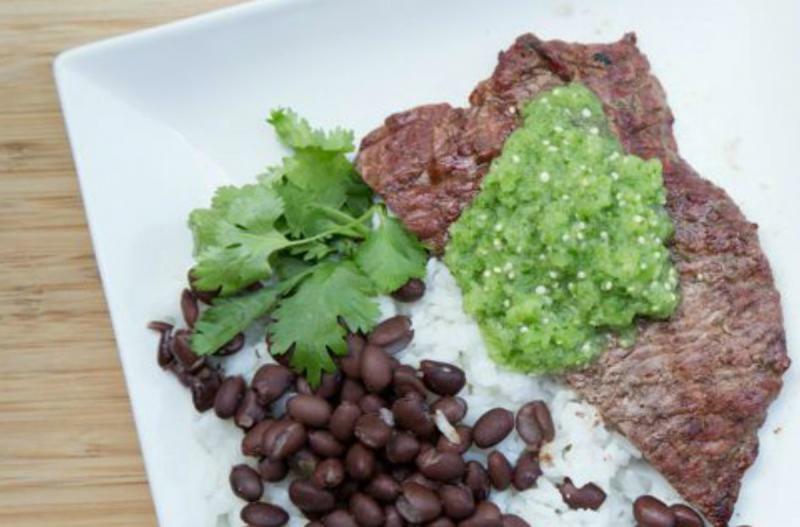 The tomatillo salsa is the perfect addition to this flank steak! Could also be good in a wrap, or on nachos! Add the tomatillos, jalapeno, cilantro leaves, juice from a lime, salt and pepper to a small food processor and puree into fresh tomatillo salsa. Season both sides of the flank steak with salt and pepper. Add half of the the fresh tomatillo salsa into a shallow baking dish or rimmed cookie sheet. Place the flank steak on top and and add the remaining tomatillo salsa on top of the steak. *Let marinate for at least 30 minutes in the fridge. Preheat the grill and then cook the flank steak 6 to 8 minutes per side. Cooking time will depend on thickness of the filet, heat of the grill and how done you prefer your steak. 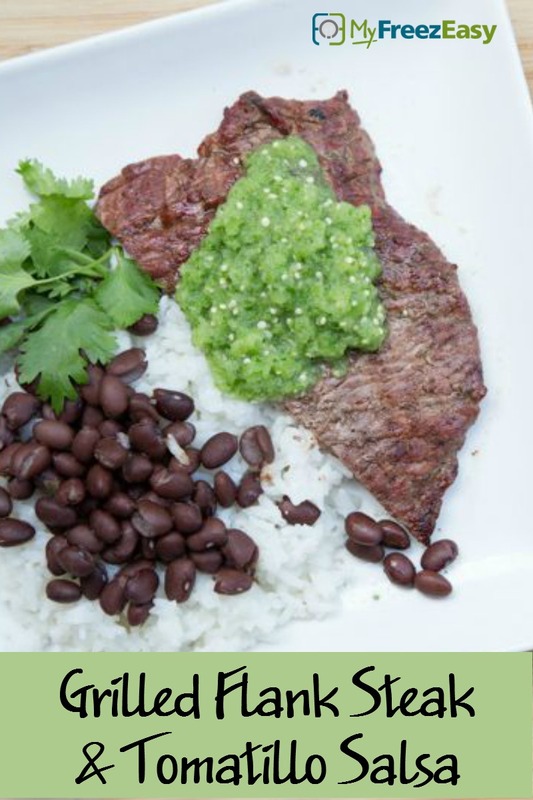 Serve Grilled Flank Steak with side of rice and black beans. Remove leaves from 12 tomatillos. Seed and diced 2 jalapenos. Add tomatillos, diced jalapenos, 2 Tbsp of cilantro leaves, juice from 2 limes, 1 tsp salt and 1 tsp pepper to a small food processor and puree into fresh tomatillo salsa. Put baggie in the freezer and freeze up to 6 months in fridge freezer or 12 months in a deep freezer. Thaw completely before grilling steak with some of the marinade brushed onto both sides of the steak. Thaw completely before grilling steak with some of the marinade brushed onto both sides of the steak. Grill 6 to 8 minutes per side, or until cooked to your liking. Slice and serve with rice and black beans.